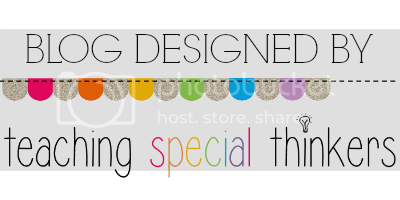 A Special Sparkle: How to Set Up a Technology Center with Visuals! 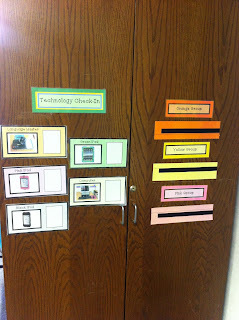 It is NO secret that I like to use a lot of visuals in my classroom. I did not hold back the use of visuals when creating my technology center. The first thing I considered was how to arrange the table so that students had "cubbies." I found that by creating individual space, the distractions and behaviors are greatly reduced. I decided to arrange my large 6 ft table and an extra student desk in the shape of a "T." I also have to keep in my wheelchair access to make sure each "slot" is wheelchair assessable for my little lovelies! I only have one computer, and I wanted it in the place that would allow for me to easily set it up and hide the cords. I also used my Language Master on the same table so that I could easily use duck tape to hide the cords from the kiddo's. On my second table I set it up as the "iPod" table. I used green duck tape (It is apart of my work center system... this is the Green table) to corner off three sections for three different iPods. This year I am doing it a little different. Each spot has a label for which iPod is to be used in this spot. This is a little neurotic and overly structured, but last year the kids would "fight" for the pink iPod. I struggled with it because they could not understand that they were EXACTLY the same.. same app's and everything. WIth this.. I created a technology "check-in" system. I will add student wallet size pictures to the mix after the first day. Student's pictures will be laminated and attached to the group sheet with velcro. When they rotate to the green table, they will take their picture and pick what they will be working on. (With the supervision of the aide managing this center) They will then find the assigned spot for what they picked! This is all conveniently taped (using shipping tape) to the brown cabinet by my "green" center! I added the visual supports at each spot to each kiddo knows where to report to!